Neighborhood Watch groups in the Tampa, Florida are not only more active than ever before, but the relationship their members share with local law enforcement is at an all time high, and the communities throughout the area are reaping the benefits. But it wasn't always this way. Just a few years ago, residents of these very same communities were not merely reluctant to get involved with the Neighborhood Watch program, they were downright afraid. Up until recently, they feared the potential backlash from criminals, who literally threatened many members with harm as a result of their ties to the program. Thanks to a new law enacted in 2004, however, residents now have the assurance that they will be protected and criminals who bully them won't get away with it. As a proud and vocal member of her local Neighborhood Watch group, an elderly Tampa resident wasn't about to take the disintegration of her community sitting down. When she saw drug dealers working her street, she'd call them on it. In no uncertain terms, she would tell them that she was a member of her Neighborhood Watch group and that the police would be hearing from her. But when the dealers began not only taunting her but threatening to do physical harm to the woman's pet dog, she began to recognize that there were definite limits to her role. Major Sophia Teague of the Tampa Police Department recognized those limits, as well. A one-time sergeant with a street-level narcotics squad, Teague had worked very closely with Neighborhood Watch groups, and she had witnessed first-hand the harassment that took place. “While my colleagues and I saw what criminals were doing to Neighborhood Watch participants, many of whom were elderly, there was nothing written on the books that would permit us to arrest them,” she explained. And Teague wasted no time in taking action. She began reading every statute that dealt with protecting victims, from those centering on protecting a state witness to those focused on safeguarding victims of domestic violence. It wasn't long before she had written her own statute, this one aimed at protecting members of Neighborhood Watch groups who were being harassed by criminals. In 2000, Teague presented her idea to now retired Senator Les Miller, and a three year fight to get the bill passed began. P hoto: Officer R. Barrett speaking at an Neighborhood Watch meeting. 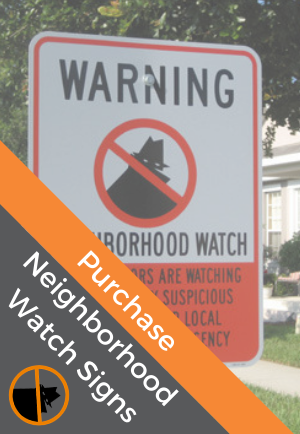 While there was support of legislation aimed at protecting Neighborhood Watch members, many in the Florida Senate felt the original bill – which classified harassing Neighborhood Watch participants as a third degree felony – was too harsh. The language of the bill was subsequently changed, making the offense a misdemeanor. Further support was garnered after Senator Miller also called upon an additional colleague to help promote the legislation. “In my first term, Senator Miller asked me to be the House sponsor of the bill, and I agreed and worked the bill so that we could get passage out of the House, which led the way for the Senate to follow suite,” recalled Representative Jennifer Carroll (R-Jacksonville). Teague continued to play a part, as well, actively promoting the proposed legislation in the community. “When Senator Miller informed me that the bill was receiving positive feedback, I contacted the president of one of our local Neighborhood Watch groups and told him to call every volunteer in Tampa to ask them to call their senators and representatives to remind them that we were watching how they voted on this legislation,” said Teague. The efforts paid off. Not only did the bill move through the House very quickly, it ultimately became the first bill signed by then-Governor Jeb Bush, and in May of 2003, legislation that makes harassing and threatening Neighborhood Watch participants a crime was signed into law. Rep. Carroll agrees. “The law has created a measure of safety for individuals so that they are not afraid of thugs,” she said. “It also lets the ‘bad guys' know that the police have the authority to incarcerate and fine them for interfering with the program.” “Now residents have the assurance that judges and the state's attorney's office are backing them,” added Teague.